Ryan Wood, daughter of 1990 Auburn graduate Rob Wood, riding Galway. 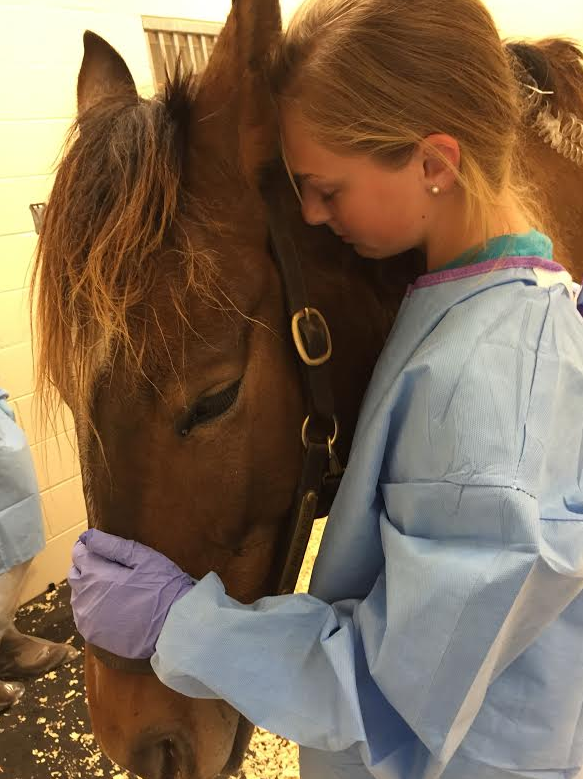 In March, the horse underwent a successful operation at AU’s Large Animal Teaching Hospital to correct a life-threatening intestinal disorder. “You better go hook up your trailer.” The words from the vet hung in the air like a fog. I knew that’s what he was going to say, but I still stood there dumbfounded for a moment. My legs went numb and my stomach felt like Saturday morning after too much Friday night. My horse was dying. It was 2 o’clock in the morning. I hadn’t slept all night, but it was time to go. Auburn is over three hours away. It had been a good Sunday. I was enjoying some post-workout crawfish and beers with the guys, my wife and daughter were at the barn. An earlier text had reported a good lesson for the horse and rider as they prepared for the upcoming national championships. We’d rendezvous for dinner in a few hours. And then my phone rang. Galway was laying down and looking at his stomach, classic signs of intestinal discomfort, 4 p.m. on a Sunday. I’m sure the local vet was thrilled when his phone rang. Not even out of town yet and I have to stop. I’m running red lights and speeding and I hit a dip in the road so hard I’m happy the trailer is still attached to the truck. I look in on him and he stares back at me. Sedated, uncomfortable, and confused, he looks at me helplessly and I choke up for the first time. “Come on, buddy,” I implore him. I pray for my horse. And for my daughter. We drive on. My phone rings. The local vet was great. He did everything he could and was at the barn three times from the 4 p.m. first call to the 2 a.m. departure. 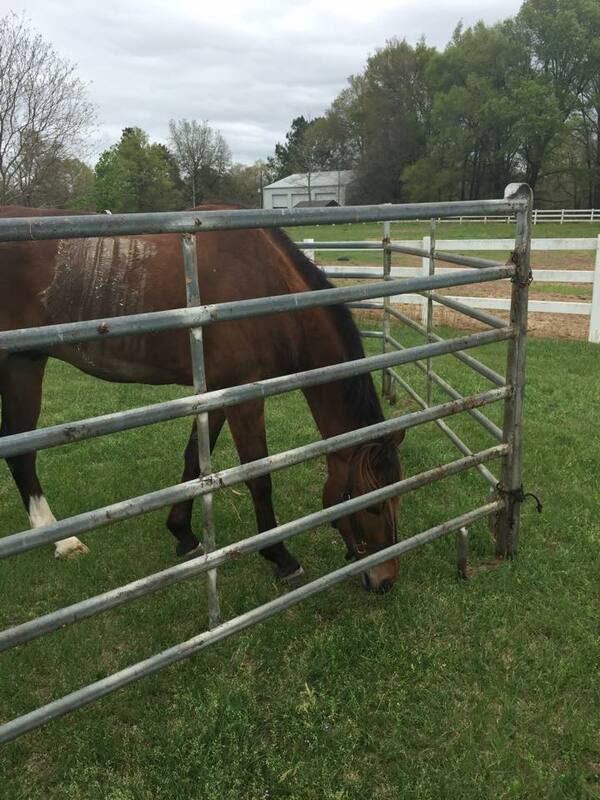 But once conservative treatments for horse colic fail, surgery becomes a possibility and that only happens at major clinics like the one found at the Auburn University Large Animal Teaching Hospital. The vet said he’d let Auburn know I was on the way and I should call them when I get close. “At 5 a.m.?” I thought skeptically. Yeah, right, OK.
Ryan Wood visiting Galway on the day of surgery. “Hello sir, I understand you are on your way with a horse. Sorry to hear that.” Auburn called me. I was still in Mobile. What the…. ? Unbelievable. I gave him the information he asked for. He told me he had spoken to the AU vets on call already. “Call me back at this number when you get close,” he said. “That way I can have the team ready when you arrive.” It sounded too good to be true. And for a second I thought it was. I made my phone call letting them know I was close, but when I pulled into the AU vet clinic I was met by a darkened building, a vacant parking lot, and a locked gate. I pressed the call button. No one answered. I pressed it again. I cursed. I reached for my phone. And the gate opened! I parked and dropped the window on the horse trailer. He was still on his feet. I thought he looked pretty good, all things considered. I went inside. I was signing the requisite paperwork but the vet student checking me in was clearly distracted. Dude, really? My horse is dying. I haven’t slept in 24 hours. I just did my best Cledus imitation without Burt Reynolds running cover for me to get here, and I can’t imagine you have that many things to do right now and… his radio chirped. And something made me turn around. He was watching what I couldn’t see. “They want you to go unload him so they can get to work. We can finish this later.” A nurse and two vet students were standing by my trailer. I choked up again. Four people there waiting on us at 5 o’clock in the morning. I couldn’t believe it. My amazement grew as I walked outside and realized the nurse was talking on her radio to the vet who was on his way. We unloaded him right there in the parking lot on Wire Road and they walked him to the back of the vet school. I finished my paperwork and was taken to a waiting room. I called my wife. One bar signal strength, no coffee in sight, and what was sure to be a long wait. I prayed. And I cried. The door opened. 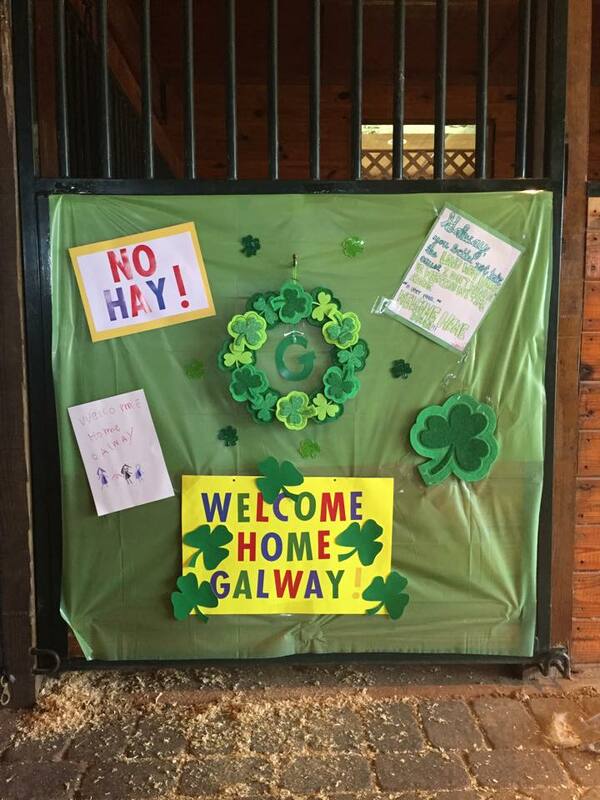 Galway was in a stall and I could come back and see him. I hadn’t been in the Auburn city limits more than 15 minutes. Two Auburn veterinarians, two students, and a nurse surrounded my horse. The lead vet alternated between instructing her students and explaining to me what they were doing and how things were going. His small colon was impacted with stool, conservative treatments weren’t helping, the pain medicine wasn’t keeping him comfortable. He was heading to surgery and it was far from a given it would be successful. The emotion of that realization crashed over me like an avalanche. He had competed at a very high level just a week ago. My daughter had ridden him yesterday. How was this happening? I completely lost it. I scratched him on his neck, “his favorite spot,” my daughter says, and gave him what would become my admonition for him: “get well.” It wasn’t so much a wish or a plea as it was an order. He’s a good boy. He does what he’s told. One more time big fella. You gotta do this. You’ve carried her, literally, over every obstacle that the course designers have placed in front of you. You have to do this. You just have to. The alternative is unbearable. I walked outside and Auburn was just waking up. It was 7 o’clock. I made some phone calls. I drove down the street to Hardee’s but I didn’t order. My stomach was back to its Saturday morning feeling. I found a place to sleep and was comatose in seconds. My phone rang and rang and rang. Every well intentioned call, every good wish sent or update sought felt like a mock execution, ring by tortuous ring. The vet said the surgery would take 3-4 hours. She’d call earlier only if things looked really bad and we had to make “a difficult decision.” Ring, ring. Jump. A number I recognize. Breathe. Thanks for the call. I’ll let you know as soon as I know. Wash. Rinse. Repeat. And then there it was. A 334- number not in my contacts. It was 11:45. It had to be good news. It just had to be. I hung up the phone and fell on the floor. I screamed. I cried. I had to compose myself. I had to call my wife and daughter. He was all right. They sped up to Auburn and we were able to visit with him that afternoon. My wife stayed in Auburn for a few days so one of us would be there in case things took a turn for the worse. They didn’t. I was promised twice per day phone calls updating his status and they came like clockwork. From the vet. Same guy. Every time. Auburn, y’all need to give that guy a vacation. And a raise. Tomorrow we leave to pick up Galway and bring him home. It’s been nine days since his surgery. It feels like nine years. We still have a ways to go and in the best of circumstances it’ll be months before he competes again. But all indications point to that happening. 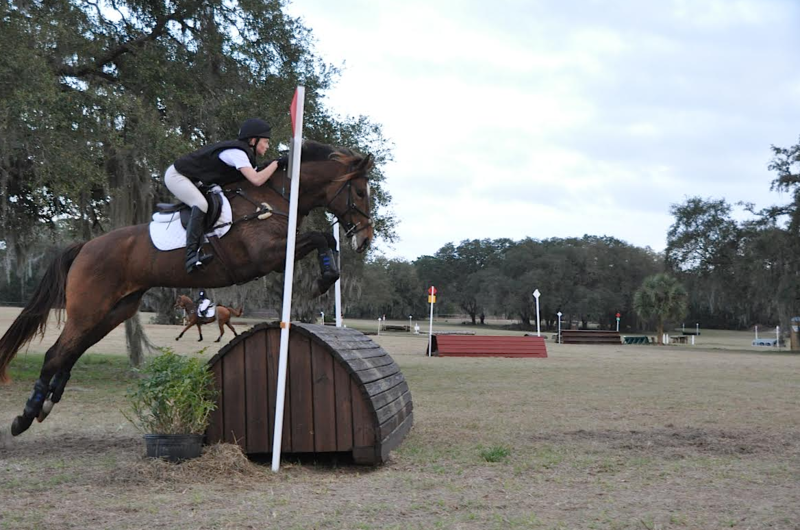 And when, in a few months, I give my daughter a leg up onto this 1,200 pound equine athlete I’ll tell her, like I always do, to have fun, to give him a clean ride, to show him the jumps and let him do what he does. And I’ll whisper in his ear to take care of her. And then they’ll burst from the start box and across the countryside, daughter and horse as one, covering ground and clearing obstacles while we strain our eyes from the finish awaiting his familiar gallop, her fist pump across the line, the comforting pat on his shoulder acknowledging another job well done. And the smiles. And I’ll know that is all possible still only because there is a place called Auburn University. And because she has a veterinary school. And because of the remarkable people who work there. I believe in Auburn and love it. Rob Wood, a second generation Auburn grad, lives in Mobile with his Auburn grad wife and two of his three daughters (the third is a student at Auburn). He didn’t think it was possible for Auburn to have a bigger impact on his life, then this happened. I am a graduate of The University of Alabama, and as I read this, I couldn’t stop the flow of tears down my face. You see, Auburn saved my dog in much the same way. It was the Sunday after Thanksgiving when my Bryant slipped a disc in his spine and was paralyzed. He had no deep pain sensation and a 5-20% chance of recovering, even after the surgery. The vets/students were waiting on us when we got there. He was treated like royalty. We were given the utmost respect, despite the Bama tshirts we had hastily thrown on after church — we didn’t even think about them on the way up there, we just wanted my baby to be okay. They didn’t have to be as kind as they were. When my dog, Bear, had to be put down, we donated money to the Auburn Small Animal Clinic in his memory. While I am a Bama grad, I believe in the Auburn animal clinic…and love it. Our vet here in Atlanta area is an Auburn grad. We call her “Dr. War Eagle” after she saved our pup’s life when other attempts were unsuccessful. We believe in Auburn’s Vet program and love it! I can speak of similar AUmazing care and treatment at AUBURN’s small animal clinic. My Bo was a referral to the oncology unit from an Auburn vet in Atlanta. He had a fast-growing squamous cell carcinoma on his nose. Was told only option in ATL was a “plastic surgeon” (yes, really!). The main waiting room was packed that day – seemed my German-born Bo was the only one not named Aubie! 🙂 Was amazed when I learned that my 35-pound English Cocker Spaniel was being cared for by no less than 4-5 people!! They removed the Cancer that day with liquid nitrogen. The care, phone calls and followup afterwards were amazing. No other way to describe it. I STILL speak the praises of the Auburn veterinary school! Amazing facility that instilled great pride in this Auburn grad.